The stretch of highway on either side of Kulin in southwest Western Australia is possibly the most interesting remote road in Australia. 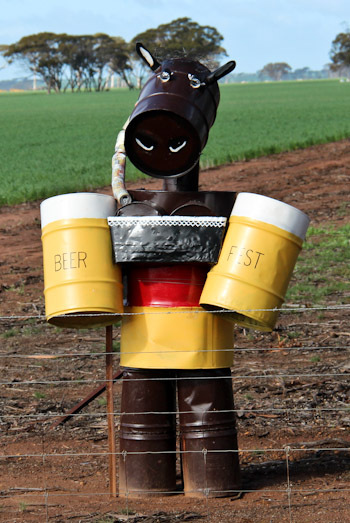 We visited the Tin Horse Highway years ago, and as we headed east across the continent, I knew the girls would appreciate the whimsical metal sculptures made from recycled materials and erected by local landowners. 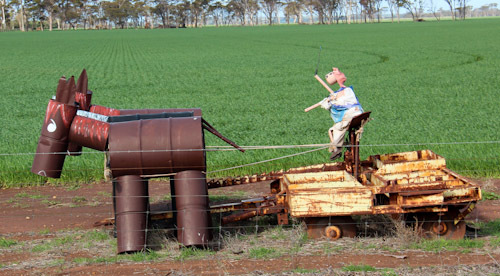 With a bit of ingenuity, the farming town of Kulin is making a name for itself among travellers. Reading a book and riding a penny-farthing? 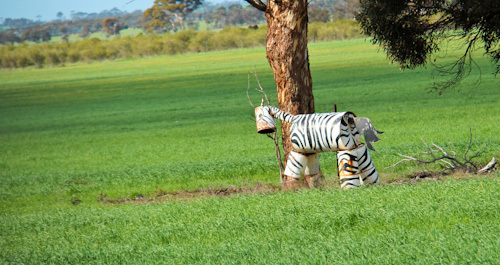 A zebra stands in the shade of some trees. 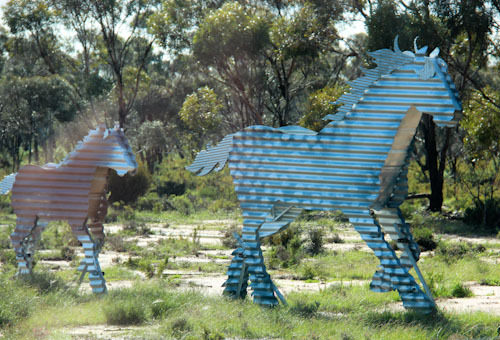 Creative marketing within the Kulin Shire Council has started an initiative that encourages travellers to promote the Tin Horse Highway through large, high-quality stickers on visitors’ caravans or motorhomes. 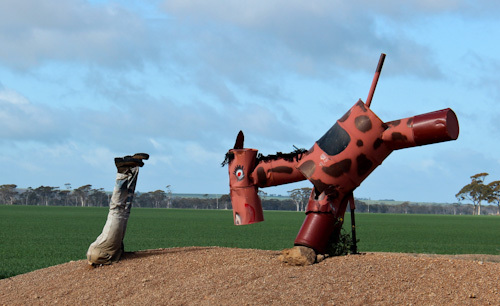 It’s a novel concept, and from the poster promoting the idea, some travellers have gladly taken up Kulin’s cause to promote the Tin Horse Highway during their travels around Australia! 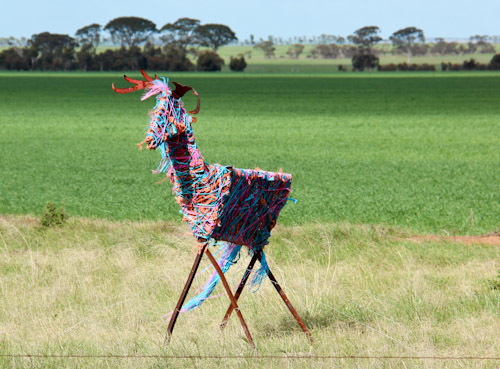 This sculpture looks more like a deer than a horse. 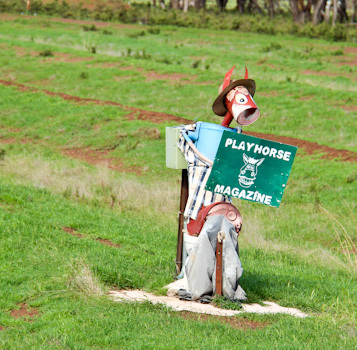 Sitting on the dunny, reading Play Horse magazine. The wheat fields don't get plowed by themselves! A more belligerent horse bucks off its rider. This "dead cert" is a play on the racing term. 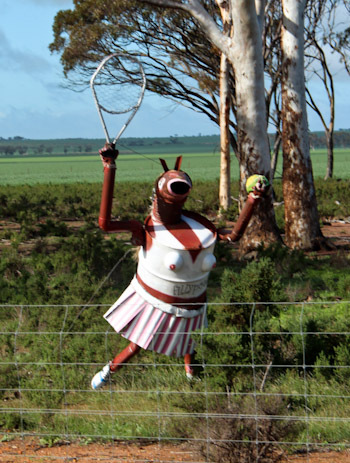 Fillypoussis... perhaps a cousin to Australian tennis player Mark Philippoussis. 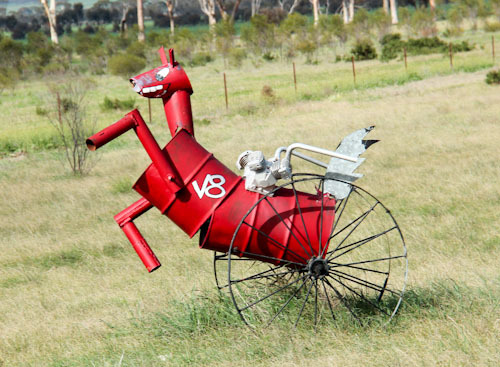 Although most of the horse sculptures are fashioned out of metal barrels, there are a couple creative exceptions, like this pair. In a creek-bed, a seahorse keeps watch. 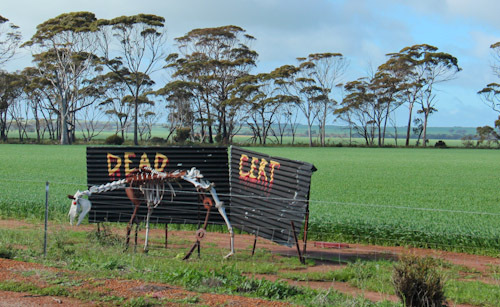 Kulin has embraced its new status as a must-see on the WA tourist route. 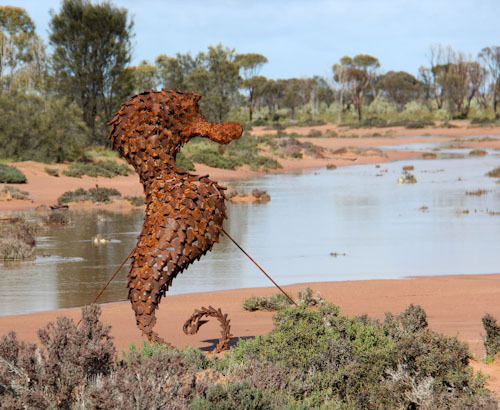 It helps that the town is not far from another major attraction — Wave Rock — and the local council has provided facilities to encourage visitors to linger a while (and spend their dollars locally). Public showers (coin-operated for hot water), easily accessible toilet and bbq facilities, a well-maintained playground are combined with a friendly attitude towards travellers (it’s an RV-friendly town). 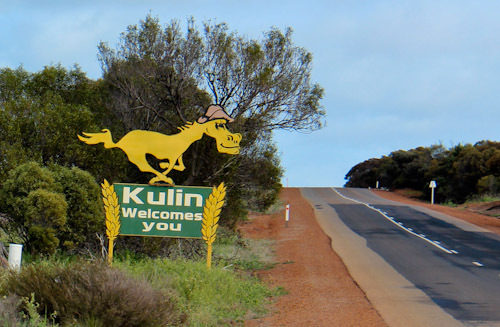 While so many small towns go wrong by charging exorbitant amounts for overnight parking, Kulin is a great example of a town that’s doing right by the nomadic set. You are giving me the travel bug for WA again! 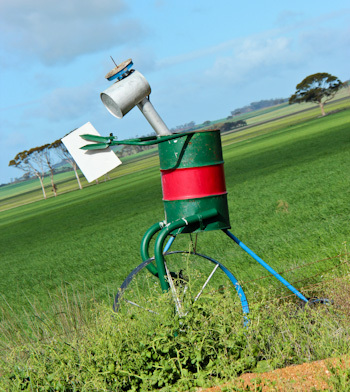 This sounds like a fantastic route to take, reminding me of the letter box route near Wilmot Tasmania! I like the seahorse best!